The best known of the steamships operating under the name Monowai was the second of two vessels that operated for the Union Steamship Company of New Zealand from 1925 until it was scrapped in 1960. The vessels were named for an island off New Zealand. She served the British Admiralty as a troop carrier during the war. The first Monowai, also a Union vessel, was commissioned for the Trans-Pacific service to North America in 1890. It lies scuttled as a breakwater at Gisborne after it was retired in 1926. She was a single stacker with two masts and designed for both passenger and freight service. 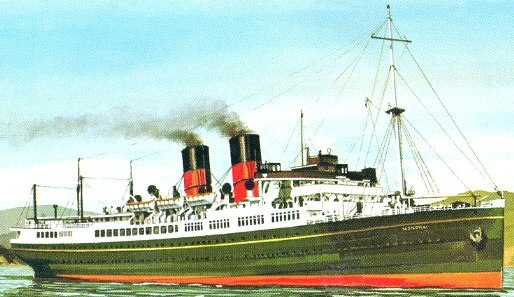 The company’s final Monowai was originally launched under the name Razmak for the Peninsular and Oriental Steam Navigation Company. She was designed for service in Indian waters and began running regular trips between Bombay and Aden, Yemen, on the Persian Gulf. The Razmak served on that route until 1930 when it was sold to the Union Steamship Co. and given her final name. That year the ship, with subsidies by the New Zealand government, was given a refit that included gun mounts in the event of future use by the New Zealand Navy. The ship’s guns were not mounted but stored at the Devonport Naval base. The Monowai’s passenger accommodation was changed for 483 third class passengers. The hull was painted Bronze Green and the superstructure was done in white. The funnels were painted red with black tops. 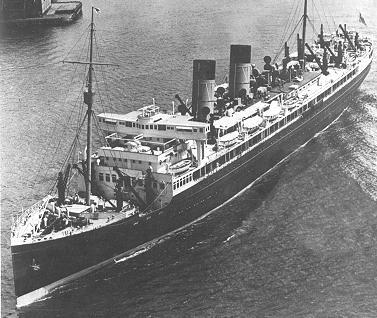 The Monowai was then put on the company’s regular trans-Pacific run, between Wellington to Vancouver, to Tahiti, Honolulu and San Francisco. She was replaced on that run in 1932 by the Maunganui, and began shorter runs between Wellington and Sydney. The ship survived its years on the seas, and the war, without sustaining severe damage. Among the worst things that happened to it was a severe gale that was encountered during a 1934 summer crossing from Sydney to Wellington. It was said to have been a force-eight Southeast gale, the worst storm known off the New South Wales coast in 20 years. The Monowai battled that storm for 24 hours, taking heavy seas that smashed windows, saturated the cabins and other facilities in the superstructure and left things in a general shambles. Among the passengers for that voyage was Alexander Shaw, the new chairman of the steamship line. On another occasion the Monowai was involved in a medical assist after receiving a radio message that a cadet aboard the Finnish sail training ship Favell was stricken with acute appendicitis. The Monowai altered course, met the Favell and took the cadet aboard through a gun-port door. She then steamed for Wellington where the cadet was treated at a local hospital. The skipper of the Monowai, Captain Arthur Davey, later was awarded the honor of Knight of the White Rose by the President of Finland for his services. When war broke out in 1939, the ship was requisitioned by the Royal Navy and she was refitted as an armed merchant cruiser at Devonport, Auckland. While she spent the war primarily working as a troop carrier, the HMNZS Monowai was armed with eight 6-inch guns, two 3-inch anti-aircraft guns and six 20 mm guns, plus some machine guns and depth charges. Her engineering officers were given commissioned rank and remained with her. In addition to carrying troops the cruiser was assigned to escourt freighters, tankers and liners between Australia, New Zealand and Fiji during the war. There was one attack by the Japanese submarine 120 in 1942. While under enemy gunfire, Monowai fired with her port side guns, her rounds just finding range as the submarine crash-dived. She then steamed at high speed to avoid possible torpedoes. Japanese records show that the sub fired four torpedoes, but they all missed. In 1943, the Monowai was taken over by the British Ministry of War Transport and converted into an assault landing ship. Captain G. B. Morgan was given command. Another major overhaul and refitting included installation of defensive armaments and replacement of lifeboats with 20 assault boats capable of landing 800 troops. Thus she participated in the vast armada of ships that landed troops during the Normandy Invasion in June, 1944. Of the 20 landing craft dispatched from Monowai that day, only six of them returned. The rest were destroyed in combat, mostly by mines during the landing. The ship served briefly as a troop transport once more after the invasion, now making frequent crossings to France. It was estimated that she made 45 crossings and carried 73,000 troops into France. The Monowai was being fitted to participate in another invasion, this time on Japan, but the Japanese surrendered before the invasion was carried out. She then was sent to Singapore as a "mercy ship." She returned home to England with 650 service personnel and 199 civilians who had been Japanese prisoners of war. After months of carrying troops back to their homes throughout the British Empire, the Monowai was in a neglected and ragged condition. When returned to the Union Steamship Line in 1946, the company was reluctant to pay the cost of refitting this worn-out ship. But because of a lack of enough ships for the fleet at the end of the war, the work was done. At a cost of over a million pounds, her aft mast was replaced with derricks, the funnels lowered and much of the open promenade was enclosed. She was modified to carry 179 first class and 205 cabin or tourist class passengers. The ship served on her old run between New Zealand and Australia until its retirement in 1960. She was sold for scrap to a Hong Kong breaking company.